Each task we run is a very narrow band sample of two seconds worth of data from one of the receiver channels and that takes at least a couple of minutes - so we are looking for a leverage of at least 100:1 in terms of performance. According to the "About SETI@home tab", aren't workunits made up of 107 second tasks, that overlap slightly? SETI@home looks at 2.5 MHz of data, centered at 1420 MHz. This is still too broad a spectrum to send to you for analysis, so we break this spectrum space up into 256 pieces, each 10 kHz wide (more like 9766 Hz, but we'll simplify the numbers to make calculations easier to see). This is done with a software program called the "splitter". These 10 kHz pieces are now more manageable in size. To record signals up to 10 KHz you have to record the bits at 20,000 bits per second (kbps). (This is called the Nyquist frequency.) We send you about 107 seconds of this 10 kHz (20kbps) data. 100 seconds times 20,000 bits equals 2,000,000 bits, or about 0.25 megabyte given that there are 8 bits per byte. Again, we call this 0.25 megabyte chunk a "work-unit." We also send you lots of additional info about the work-unit, so the total comes out to about 340 kbytes of data. 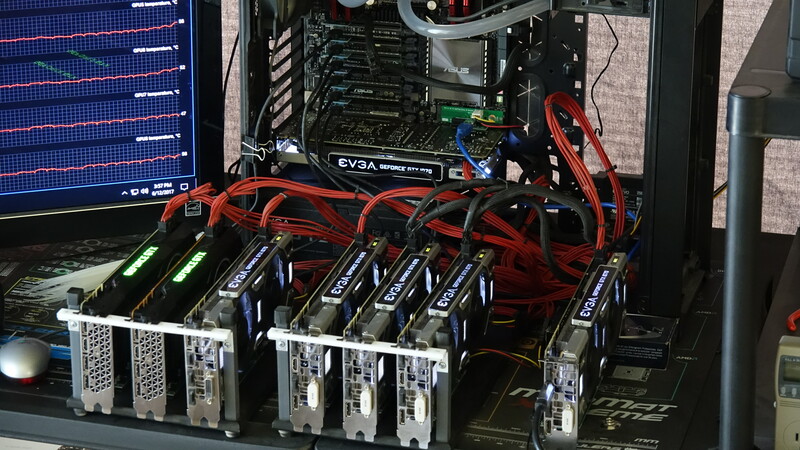 If I had credit card debt, I wouldn't even think about buying anything for SETI at home like the 1070ti's until you paid off the debt. Then, I would save up enough money to have an emergency fund for unseen expenses. I'm not trying to put anyone down. Just saying my own opinion. Yes, I have a 50% error rate with my AMD astropulse tasks. I finally stopped doing astropulse tasks to not ruin the results data in case my wingman also had the same issue. I do want to point out that I'm getting a lot of invalid Astropulse v7 results (approximately 50%) on both CPU and ATI GPU. I'm not overclocking anything and temperatures are good. This has been ongoing, even before I entered the new commandline. The regular v8 8.00 CPU and 8.20 ATI GPU tasks are nearly 100% valid. Actually I took an old case with a 220W power supply and put in a AMD Ryzen 5 2400G. Power only goes to 30 Watts without the graphics card fully load with setiathome. Cost $860 for all parts with os. Can run AC odyssey smoothly. I see you just joined and this is your first post. Welcome to the project and forums! Edit: There is no difference for AMD cards between v8.20 and v8.22. All modifications are Nvidia only. Thanks again, Mike! I tried your suggested commandline again and its working great! My BLC tasks are finishing in about 7 minutes (instead of 8 minutes with without your commandline) on both my RX470 and RX570. It's been running for a few hours now and everything looks good. This thread needs more love!!! Sorry for the HUGE pictures, I'm not sure how to re-size for forum use? Also, if you think cable management is important, consider this your "trigger" warning! 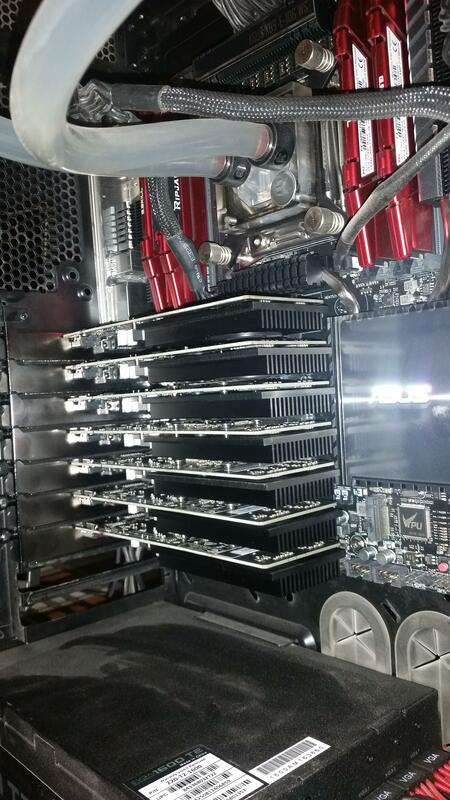 *Motherboard has 7 PCIe slots & a PCIe M.2 slot, hence the ability to run 8 GPU simultaneously. *When the M.2 slot is used with a GPU, this is the card that drives the monitor. Unsure why. I forget the H2O system, RAM, and other component stats, as this was a couple years ago. Windows 10 and Stock SETI App. Same rig with seven Zotac GT1030 single slot cards. This short-lived test was quite important for what, at the time, was my eventual goal for my dedicated SETI rig. 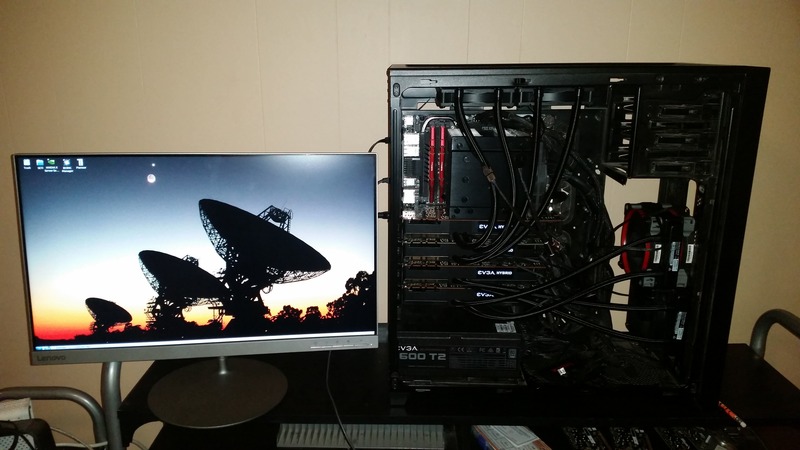 Rig as it sits now (finally back up and running!). That was my eventual goal, but I ran out of money so 4x Titan Xp will have to do haha! Even If I had the money to complete my build, I would still have (as Ian&Steve C. mentioned) power delivery issues. I'll have to wait until I own a house and can make some specific modifications to the electrical system before I feel comfortable adding much to this unit. A custom water loop with an external (read: outdoor) radiator is also on the list, but that's another insane idea that is just going to have to wait. Let's see some more crazy rigs!!!! 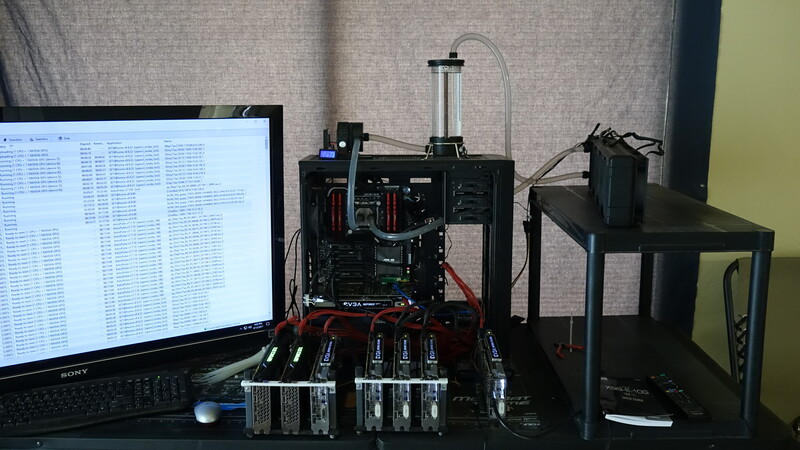 I was browsing on Youtube for SETI videos and your computer setup with 4 titan Xps being converted to water cooling came up. I watched it. It looked like a neat project! + any other terms you see used below that you'd like to point out what they mean. Thanks! Thanks for keeping us updated on your progress with Nebula! It seems to be a difficult process to try to remove RFI to weed out any false positive signals without losing any potential real signals. I'm not a programmer, but I did start trying to learn Java. I followed along with a book called Java in 24 hours and wrote the same programs that were in the book. Then I used the book to write a couple small programs of my own. That was a year ago. I don't know exactly why without seeing a screenshot of your screen. Did you click "view graphics" and the screensaver doesn't display? Thanks everyone! That helps a lot. I use the lunatics version of the seti apps, so I can't see the screensaver to find out the info on the task anymore. I remember being able to do that in the past, and I read the web page on how to understand what it was telling us, so it made sense after a while. Originally, when I first downloaded BOINC back in July, the SETI screensaver was overwhelming. I've noticed that the "13dc" tasks take longer than the "blc14" tasks. I remember reading once how you can read info about a task based on its name. Can anyone point me to the web page that explains this, or give me a quick review? That's not where the cc_config.xml file should go. Make sure first there isn't already such a file there, and that it doesn't already contain a line for <use_all_gpus>, because if you add your own line at the top of the file, and there's another at the bottom with an opposite switch, the last line is used. If a line is present, change its value from 0 to 1 and save the file. Thank you!! This worked! Thanks everyone for you help! I would never have figured this out on my own. Make sure that "Show Hidden Files/Folders" is Enabled, AND "Show Extensions..."
If this was NOT done previously, then, (as Juan suggests), your "cc_config.xml" File is REALLY "cc_config.xml.txt"
I think I did save it as .txt I opened it and did "Save As" all files. Now its full name is cc_config.xml. However, it didn't solve the problem. I'm going to try a clean install of the drivers next. So here's the history: I had a RX 560 originally. Then I added an RX 570 and BOINC used both GPUs no problem. I decided to upgrade the RX 560 to an RX 470. I used just the RX 570 for a while while until the RX 470 came. I installed the RX 470, updated the drivers, restarted the computer and BOINC only used the RX 570. I added the CC_config file to boincdata folder and then restarted my PC twice. BOINC started using the RX 470 and not the RX 570 now.